The government may be adding to the budget crisis by steering you away from fast food and smoking. BOSTON (TheStreet) -- Snuffing out cigarettes and cracking down on unhealthy food may seem noble crusades to those who promote them, but also may be adding to federal and state budget woes, slowing job growth and eroding your portfolio. To be sure, smoking and obesity-related health conditions are a drain on the economy and a significant driver of skyrocketing health care costs. A recent study by the Society of Actuaries found that the total economic cost of the overweight and obese population in the U.S. approaches $270 billion per year. That study put the cost of their needed "excess medical care" at $127 billion, with billions of additional economic impact from lost productivity. The most clear-cut way health-related activities have the potential to erode financial health can be seen in anti-smoking efforts. That has led to government efforts that have been both lauded as good for the public interest and derided as further encroachment of a "nanny state" mentality. Among the steps taken in states and cities around the nation have been increases and proposed increases for soda, candy and alcohol taxes. The problem here is that ultimately states are cash-strapped and looking for any and all revenue they can grab, and if a tax on soda, for example, is successful, consumption drops and that means the money counted on does as well. It's a Catch-22. San Francisco has led the nation in the fight against fast food that is believed (at least by some) to be unhealthy but all too often a mainstay of children's diets, and has already banned some marketing seen as targeting children, putting the kibosh on toy prizes in McDonald's ( MCD - Get Report) Happy Meals. Other cities, such as New York and Boston, have gone after doughnut addicts with a ban on the use of trans fats, something the Illinois legislature is considering. The catch is that steering folks away from Taco Bell ( YUM - Get Report) or Krispy Kreme ( KKD doesn't necessarily steer them to a farmer's market. That could lead to a drop in the meals tax states and municipalities collect. If a "healthy eating" campaign was successful in nibbling away at the bottom line of fast food restaurants, jobs could also be lost. According to the National Restaurant Association, the fast-food industry is forecast to bring in $167.7 billion in sales this year. Industrywide, restaurants are the nation's second-largest private-sector employer, with 12.8 million employees. It could be argued that leaving the marketplace to evolve on its own is already having the desired effect. According to the National Restaurant Association, 76% of adults said they are trying to eat healthier now at restaurants than they did two years ago; 70% of adults said they are more likely to visit a restaurant that offers locally produced food items. Having more carrots doesn't necessarily require more sticks. Undeniably, billions are spent each year to treat illnesses tied directly to the habit. States are in the unenviable position, however, of having every smoker they persuade to quit drive their already precarious budget assumptions further into chaos. In 1998, a lawsuit against cigarette makers by a coalition of states resulted in the Tobacco Master Settlement Agreement, which would pay out $206 billion over 25 years. But as anti-smoking campaigns and higher taxes have helped reduce the number of cigarettes sold each year, states are finding that the money they relied on is drying up quicker than they thought. And it's not just health programs and prevention campaigns that suffer. From the start, states have been diverting tobacco money into everything from road projects to pension propping. According to Richard Larkin, senior vice president and director of credit analysis for Herbert J. Sims & Co. -- an investment banking firm and fixed income financial services brokerage in Southport, Conn. -- "rapidly declining cigarette sales and an ongoing dispute between the states and tobacco manufacturers contributed to a sharp 16.4% decline in 2010 payments" made under the MSA. The 12-year average for shipping declines has reached over 4%. From 2008 to 2009 domestic cigarette shipments dropped 9.3%. That drop was, in part, responsible for that 16.4% decrease in payments to states last year, to $6.4 billion, far from the expected target of $8.1 billion put forward with the execution of the settlement agreement. Initially, the MSA projected that annual cigarette shipment declines would be less than 2.7%. This year's payment decreased by 5.6%, and Larkin expects that "the big drop in 2009 sales will have continuing consequences in 2011 and beyond." Among the reasons for the decline in consumption were a 61-cent increase in federal excise taxes passed by Congress in 2009 and higher per-pack taxes at the state level. "While price increases have accelerated declines in smoking, mostly because of tax increases, anti-smoking laws have been just as important," Larkin says. "It's getting to the point that even if you can afford to buy cigarettes with higher and higher prices, it's harder to find a place to smoke them because of all of the anti-smoking laws." According to Larkin's analysis, sales declines might have only reduced payments by about 1.5%. But tobacco companies are now saying they are entitled to lower payments because they lost market share from companies that were not part of the MSA. 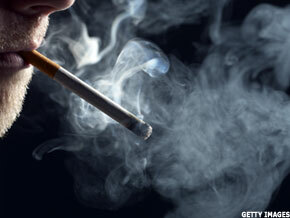 Last month, as is customary, the major tobacco companies made their annual payments. Altria ( MO - Get Report), the nation's largest cigarette manufacturer, paid out $3.5 billion but held back on paying another $267 million, placing it instead in escrow fund. Since 2005, R.J Reynolds ( RAI and Lorillard ( LO have also parked a portion of their payments into a fund while protesting the formula that determines their assessment. Those frozen payments have caused distress for state budget handlers who were counting on the money. The bad news from slowing cigarette sales gets even worse because states securitized their tobacco settlements. Looking to expedite their ability to spend their share of the settlement, states authorized tobacco settlement bonds, a specialized, tax-free municipal bond offering that put up some, or all, of the otherwise staggered payments at a loss to secure an upfront budget boost. Because they entailed slightly more risk, the bonds had better yields -- as much as 6% -- making them attractive to investors. Some states, among them New York and California, have guaranteed the debt with general revenue to make them more attractive. Fewer smokers smoking less has forced a revision to projections made at the time of these issuances. "Those states that sold tobacco bonds against the settlement revenue aren't being hurt at all -- the bondholders are feeling the effects of shrinkage," Larkin says. He elaborates in a May 16 analysis released by Sims. "The shortfalls in 2011 revenue continue to put a dent in cash flow that was expected to generate surplus revenue above bond interest costs and allow debt reduction through prepayments under the so-called 'turbo' bond structure," Larkin wrote. "Following the negative 16.4% decline in 2010 revenue, the additional decline in 2011 has already claimed three victims. California's Golden State Corp. and Ohio's Buckeye Financing Authority announced that they would need to use debt service reserves just to meet minimum required interest and serial bond principal payments on June 1 or Dec. 1. Virginia will also need to use debt reserve funds for their Dec. 1 interest payment." "While the need to use reserve funds to meet minimum debt service requirements is troublesome, it does not mean that any tobacco bonds ... are in danger of imminent default," he added. "Debt reserves remain high for all issuers, which will help stave off default in the short-term. However, 2011's developments increase the risk of defaults in the longer term."